Once Kobe has reached Level 46 he will summon you to a Cellar. 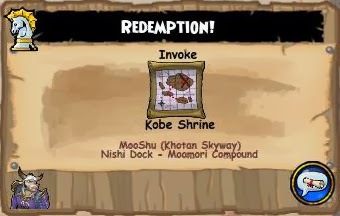 Kobe tells you that he must claim his birthright, the right to become a Samoorai Lord, now that he has defeated the man who destroyed his home. To do so, he must visit his old house, and invoke the Kobe Shrine. Once you invoke it, his old friend appears and tells him that his kinsman lies in Hamamitsu. Kobe's relative is pleased to see him, and tells him that an evil man, Yoshinaga was the man who destroyed his family under the rule of General Tso and last he heard, he was in Subata Temple. Lord Chagatai tells you that Yoshinaga was in fact here, and helped against the invasion of the Amber Horde, then he left for the Ravaged Valley. 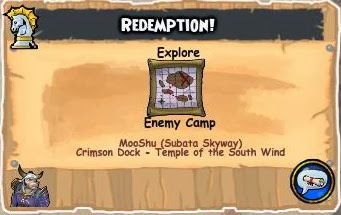 The place where Yoshinaga is said to be, has been destroyed, fortunatly, a crew member remains and tells you that Yoshinaga attacked their camp and said something about the Temple of the South Wind. The Temple of the South Wind is overrun by Inoshishi bandits, Kobe doesn't like that such a spiritual place has is plagued by evil, maybe defeating a few will rid the Temple of them and lead to Yoshinaga. 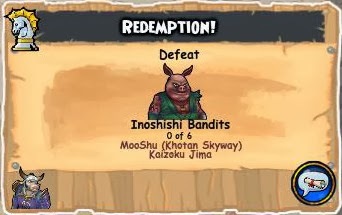 One of the Inoshishi talks and tells you that their Master resides on Kaisoku Jima, in Khotan. 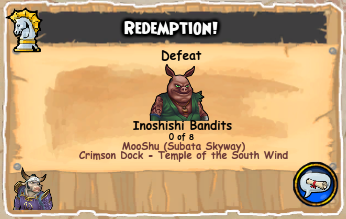 Once again, a once peaceful place is overrun by Inoshishi Bandits. Time to clear this place out. 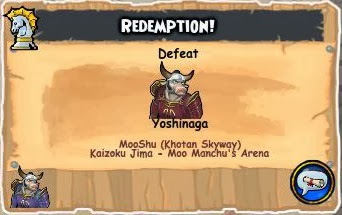 Eventually, you find Yoshinaga in Moo Manchu's Arena, and even find Moo Manchu himself, who lets you fight Yoshinaga on the grounds that you are fighting him for a good reason; revenge. After defeating Yoshinaga, Kobe feel she has earnt the name of Samoorai Lord and it's time to Celebrate in a Cellar!